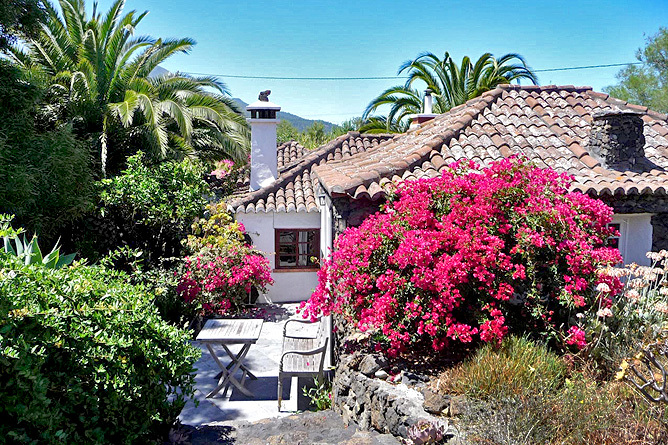 The 4000m² property is perfect for families with children as there are many cosy areas and sitting corners in the garden. However, the idyllic Holiday House also makes a romantic place for couples, who prefer to enjoy an undisturbed togetherness. 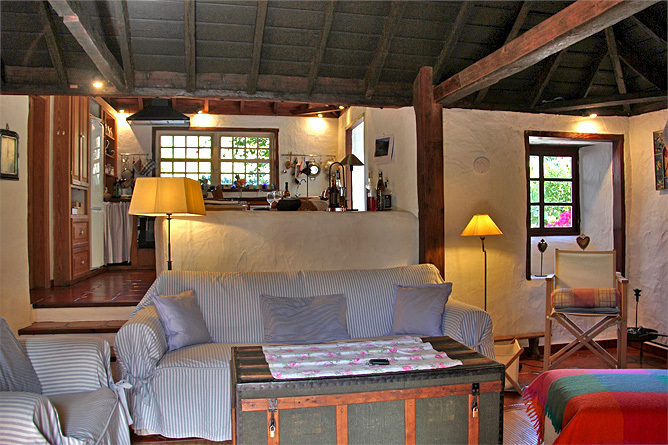 The Holiday House comprises a 140m² living area and offers space for up to 4 persons and a baby. Electricity, heating, fireplace, internet, water, bed sheets, towels, and the use of all appliances like the washing machine and dryer are included in the price. The sauna can be used for an additional fee of 30€. 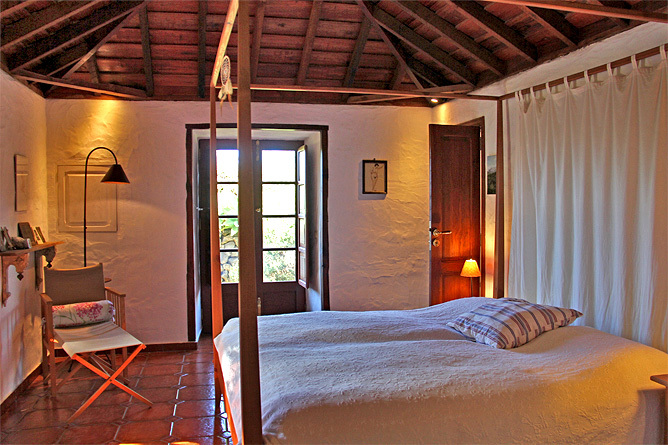 Repeat guests are granted 1% discount (up to 10%) per year, please specify with your booking. Discounts cannot be combined, the highest discount will be applied. Outside, the Thick natural stone walls form a harmonious picture together with the lush vegetation and at the same time provide a good indoor climate. During the extensive renovation, a great deal of attention was put to maintain the original character of the house and at the same time offer modern comfort. 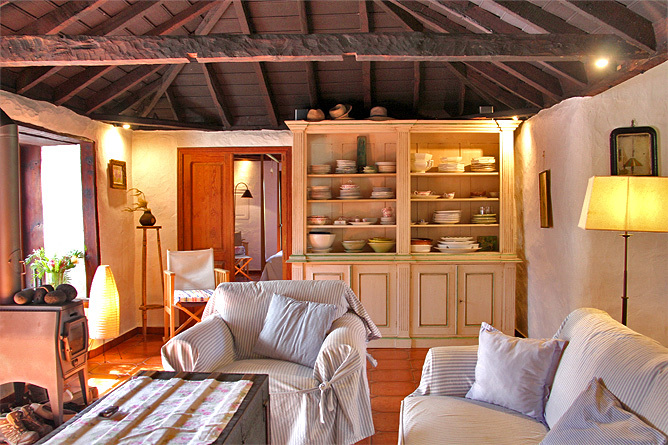 Little details like the original tea wooden gabled ceilings, traditional wooden windows with window seats and the natural structure of stone walls create a cosy atmosphere and proper furnishing perfectly complements the ambience. 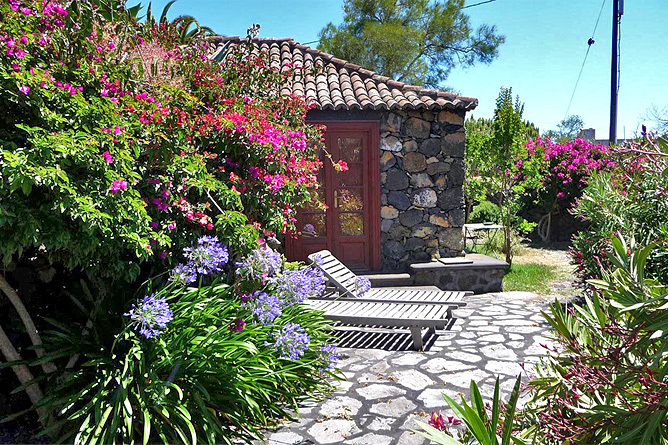 All rooms provide access to the outdoor area and the green garden. 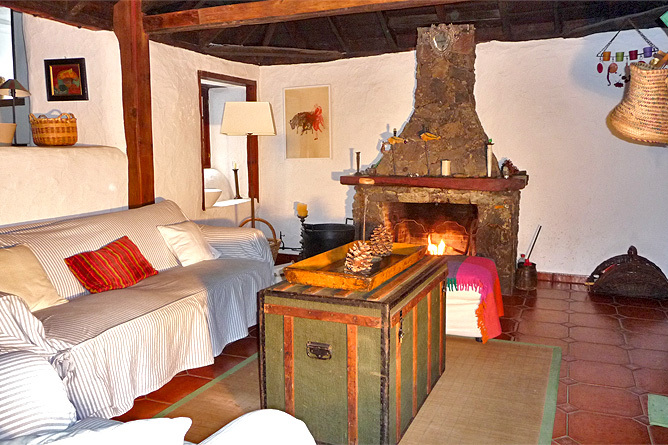 Rooms radiate warmth and comfort providing a whiff of the past and at the same time offering modern comfort: next to the open fireplace there is a gas-central heating, a satellite TV and internet access. The Holiday House is accessible through the living area that continues to the open kitchen. The living room featuring a Canary wooden ceiling is furnished with a sitting group, and a reading chair with a reading lamp next to the fireplace. An antique wooden chest makes a perfect table. And the large china cabinet next to the wall to the main bedroom, makes a very special piece. Next to it, there is a lovely decorated window recess with typical Palmerian wooden window seats. On cool winter nights, a small wood burner can additionally be fired to enjoy more cosy warmth. A few stairs lead to the separate kitchen. The large dining table with a bench as well as four chairs offers space for the whole family. 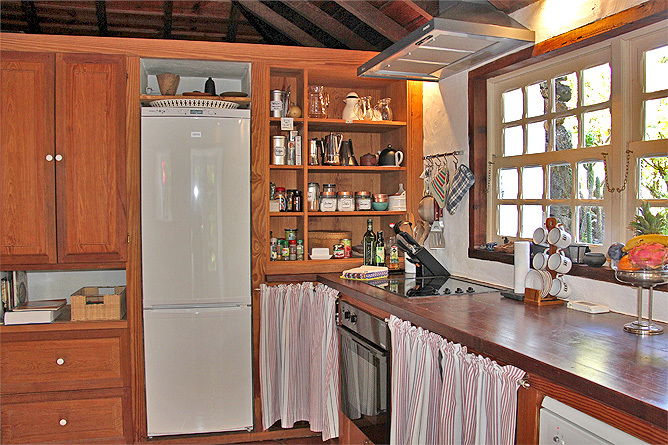 The kitchen is well equipped, hardly anything is missing. Large cabinets offer plenty of storage space. 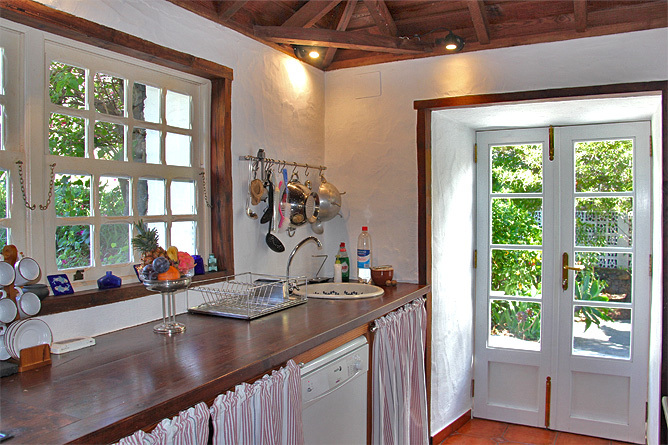 A beautiful, traditional "Guillotine - window" in the kitchen provides you with a marvelous view of the garden while cooking. 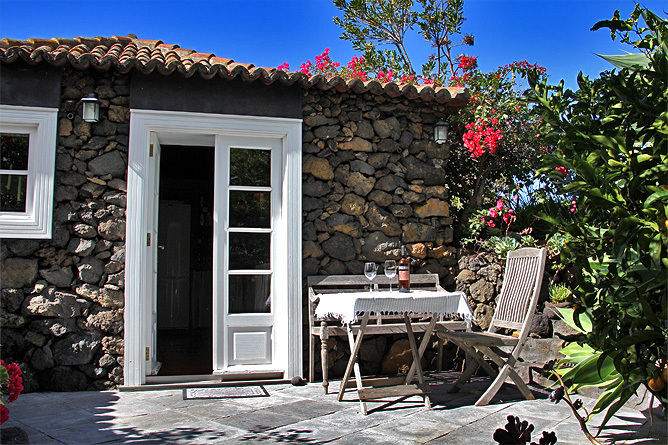 From the , a door provides access to the small, furnished terrace. Below there is another sitting area, surrounded by high trees that provide shade on hot days. 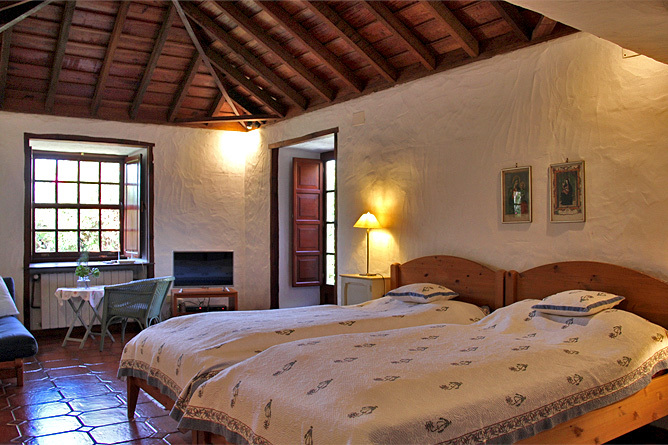 The bedroom has a large double bed and is accessible from the living room. 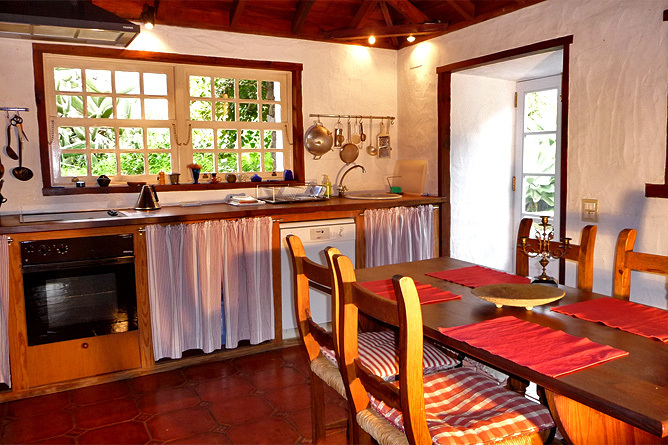 The kitchen provides access to the second bedroom with two single beds. There you also find a small flat screen satellite TV and a sofa to make yourself comfortable. 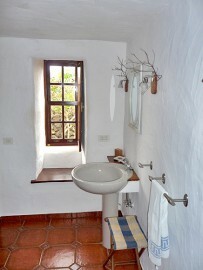 In the corridor that leads to the second bedroom there is a toilet with a wash basin. Both bedrooms provide access to the outdoor area where you can enjoy the warm sun at noon. 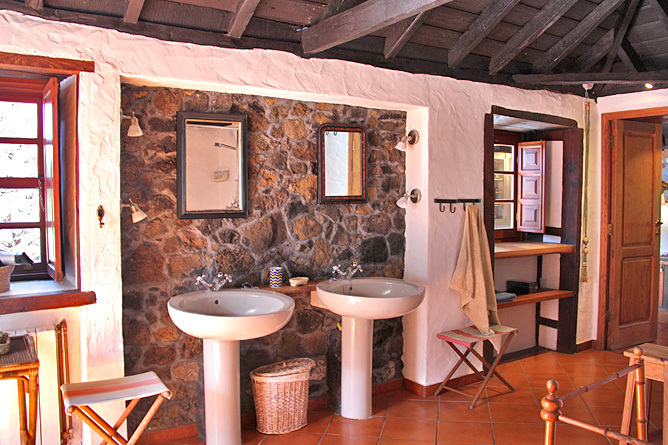 On the other side of the living room there is a spacious bathroom with a double wash basin, a shower and a bathroom. 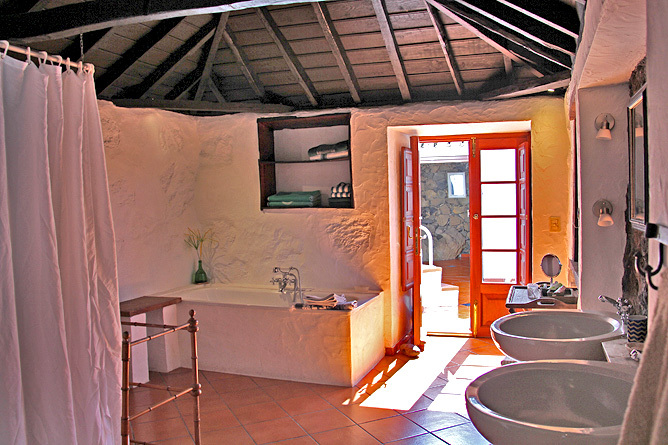 There are also a separate toilet and a bidet. 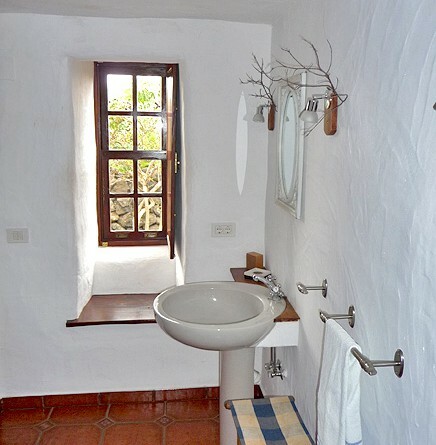 From the bathroom, a corridor leads to a small patio where the sauna is located. There is also access to the outdoor area with a grill. It is a nice place to relax, sheltered from wind. 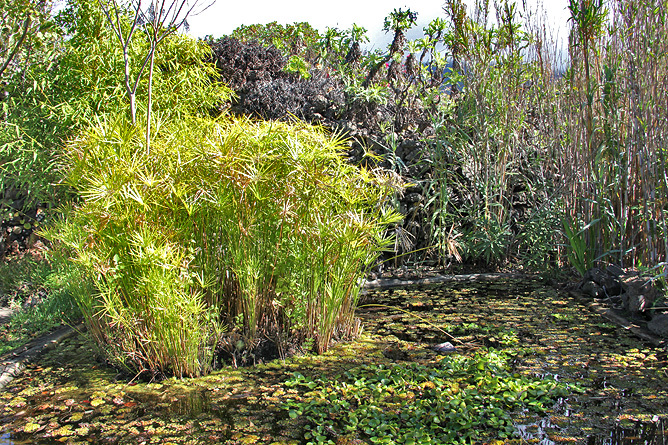 The garden is well maintained, however, it mostly kept naturally. Enchanted corners, cosy areas, a large lawn that can be used as a playground for children, many different sitting and relaxing facilities offer something for everyone. The extended property also features a small viewpoint in an elevated position with a stone sitting group. 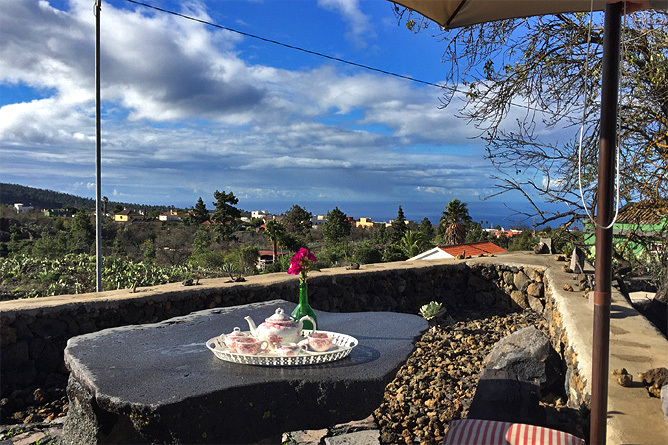 From there you enjoy a spectacular view of the mountains and towards the ocean. The small town El Paso is located 2 driving minutes and within 10-15 minute’s walking distance. There you find the large supermarket Hiper Dino, a farmer’s market (market hall), two whole food stores and a German baker as well as pharmacies, banks, and a gas station. 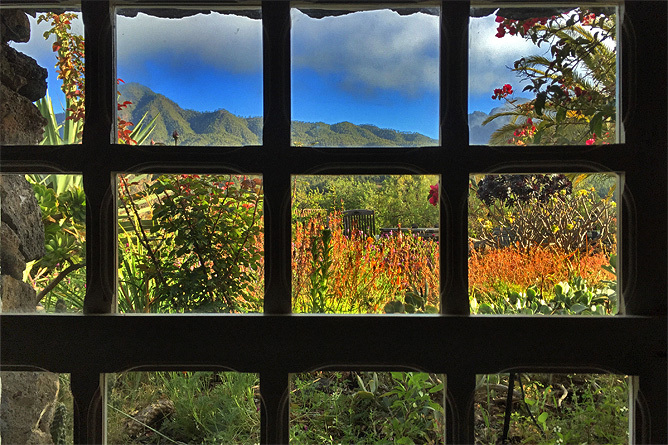 Different restaurants, bars and cafés invite you to linger. 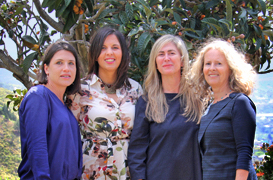 We recommend the restaurant "Perla Negra" in the town centre and the Bar "Tapas and Trekking" on the church square. 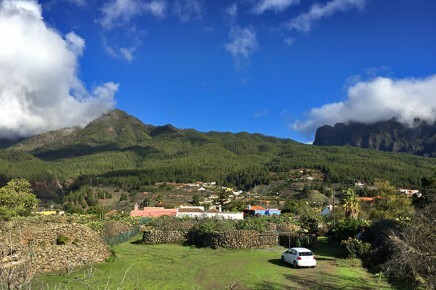 In front of the town hall there is a lovely Plaza with a Kiosko – an Art Snack Bar/Café, where you enjoy a coffee or a beer with the locals and enjoy a 360-degree panoramic view of the mountains and the sea. 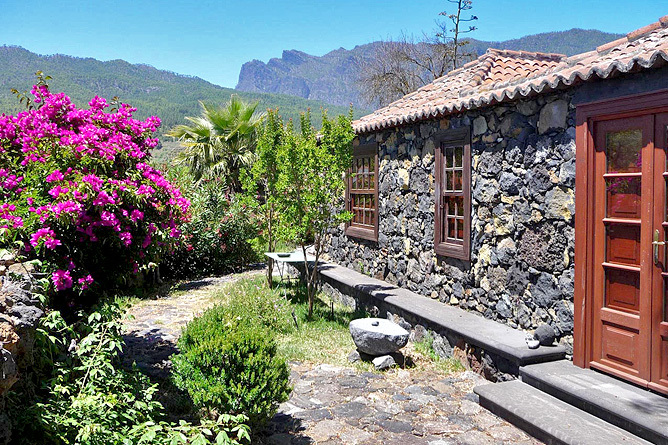 Due to its proximity to the National Park Caldera de Taburiente and the mountain ranges Cumbre Nueva and Cumbre Vieja the Holiday House is a perfect starting point for walks, hikes and trips. 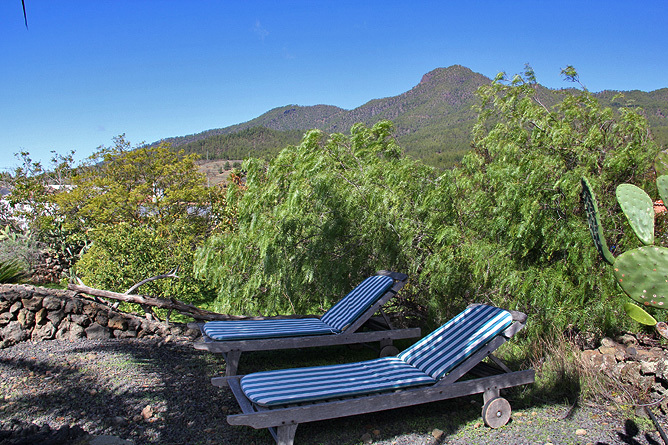 Popular attractions are the visitor’s centre of the Caldera de Taburiente, the viewpoint La Cumbrecita, the area Llano del Jable with the Ruta de Volcano and the astronomic viewpoint or the gorgeous pine woods. 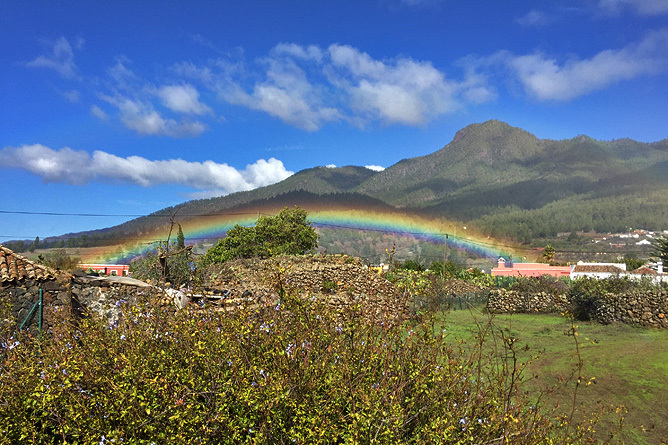 Moreover, those with a good physical condition can start their tour right in front of the door and hike up to the Cumbre Nueva and from there continue their hike along the Caldera brim. 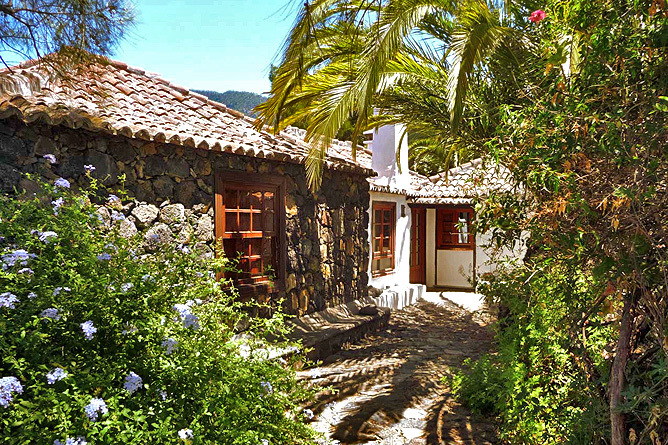 The vivid town of Los Llanos de Aridane with its beautiful pedestrian zones and historic houses is only 12 driving minutes from the Holiday House. The sandy beaches of Puerto Naos and Puerto de Tazacorte are located within 15 km. 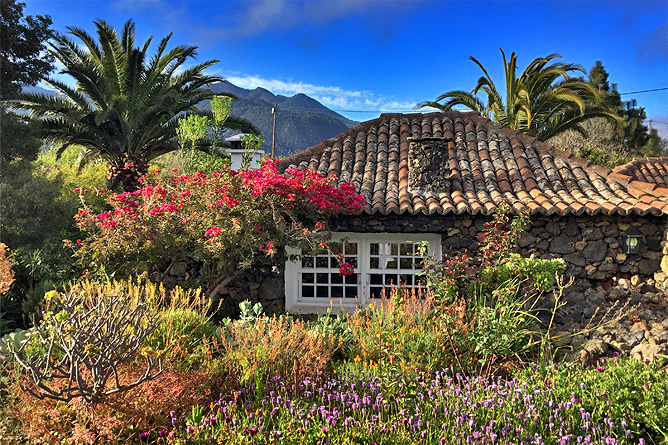 A rental car is absolutely necessary for this La Palma Holiday House. Romantic, excellent equipped Country Holiday House with spacious Garden.